New research on crocodiles shows that a combination of changing sea levels and temperatures were responsible for driving their biodiversity over millions of years. Living crocodiles are threatened by climate change, with 10 out of 23 species at a high risk of extinction. As ectotherms, animals which require external sources of heat to function, they are sensitive to changes in temperature. With 2-4 degrees of increasing global temperatures predicted over the next century, these ruling reptiles have never been more threatened. The fossil record is our gateway into understanding the evolutionary history of crocodiles. They actually have a long and complex ancestry, going back around 250 million years. During this time, crocodiles and their ancestors, known collectively as crocodyliforms, diversified into an array of forms, including 12-15 foot giants, dwarfed species no bigger than a cat. Some groups even took to the seas, evolving sleek and ‘dolphin-like’ forms, including flippers! The origin of modern crocodiles, known as crocodylians, was around 80 million years ago, during the Cretaceous period. During this time, most of the Earth was experiencing high temperatures, and known as a ‘greenhouse world’. Yes, Nessie had to be in the title. Am I sorry? A little. But not enough to not use it. Colleagues from the University of Edinburgh and myself have described the first Scottish crocodile fossil! It’s from the Isle of Skye, from a time known as the Middle Jurassic, and dates back around 160 million years ago. Based on a partial bit of a jawbone (the dentary), it’s hardly the most spectacular fossil we’ve ever found, but it tells quite a neat story. Based on the features we could identify of the jawbone, we were able to identify the specimen as belonging to Theriosuchus. This genus has quite a complicated history, and currently 5 species are assigned to it that span some 100 million years! That’s pretty long lived for a single genus. Theriosuchus belongs to a group known as Atoposauridae, which based on our current understanding went extinct along with the non-avian dinosaurs at the end of the Cretaceous period. Earth’s history is punctuated by extreme events known as mass extinctions. The End-Permian extinction, 252 million years ago, is believed to be the biggest, killing 90 % or more of all species – no wonder it is also called “The Great Dying”. The big question out there is to understand what caused it, but it is a challenge to get the complete picture of an event so long ago in prehistory. We know that the Siberian Traps (the enormous field of volcanic rock that lies in Siberia) were formed around that time and that volcanic activity was a likely trigger for this mass extinction. But what actually happened? And why did so many species, including many groups of insects, disappear? Last year, an article appeared that brought forward a new hypothesis. From evidence in rock cores, Daniel Rothman and co-authors [1,2] concluded that around the end of the Permian, a lot of organic carbon that was formerly trapped in the sediments was converted into CO2. This change happened so fast that its release was exponential. 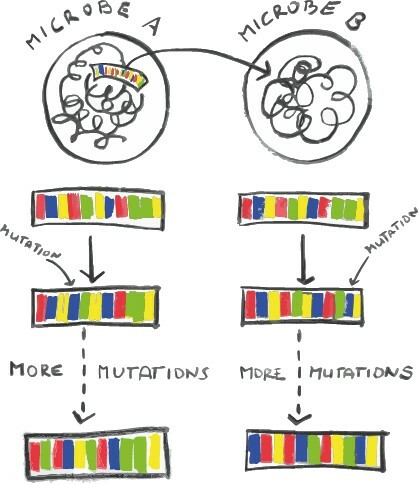 When genes are passed on from microbe A to microbe B, both undergo a certain number of mutations per period of time.